There are as yet no official plans for any Boeing 797. Up until a couple years ago, most people believed Boeing's next major project might be a follow-on to the 747 to compete with Airbus's super-jumbo A380. While Boeing pushed developing an upgraded 747 model, most airlines indicated that they would prefer an entirely new design instead. The only publicly released concept I've come across for this potential new-build aircraft is shown below. Boeing's internal designation for this design study was the 763-246C. If it had gone into production, it would likely have been rechristened the 797 to conform to the standard Boeing naming convention. Now that the 787 designation has been assigned, any new replacement that Boeing might launch to replace the 747 would probably be called the 797. Once the 7-7 designations are exhasted, it is unknown what convention Boeing might adopt next. Possibilities include 8-8 or maybe 7--7. Only time will tell. As illustrated in the following image, the 763 concept not only provided room for 450 to 550 passengers, but could be equipped with sleeping berths in an upper deck for longer intercontinental routes up to 9,000 nm (16,740 km). Nevertheless, Boeing abandoned both the upgraded 747 and any potential replacements, at least temporarily, when it announced plans to focus on a completely different market for its next major project. Instead of building a very large jetliner to carry 500 or more passengers, Boeing believed a more lucrative market existed in carrying about 250 passengers over very long ranges at higher speeds than is possible with conventional airliner designs. This philosophy was reflected in the Sonic Cruiser concept unveiled in early 2001. This aircraft would have been a competitor in the 767 and A310 class of airliners. The Sonic Cruiser created somewhat of a sensation when first announced, but airlines and Boeing became progressively less enthusiastic over the ensuing months. 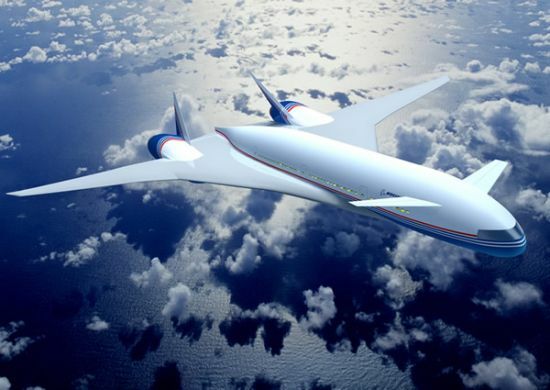 The aircraft would require rather substantial improvements in technology to achieve its stated goals of cruising at about Mach 0.95, compared to Mach 0.8 for most commercial airliners, over a range between 6,000 nm and 10,000 nm (11,120 km to 18,530 km). This kind of technological advancement could well drive up the cost so much that most airlines showed no willingness to commit to the idea. Even the percieved advantage of a faster commercial aircraft caused concern because of all the scheduling difficulties it would raise. The terrible financial situation of the airlines after September 11 only worsened prospects for launching the design. Due to this lackluster response and its inability to make a strong business case for the aircraft, Boeing officially shelved the Sonic Cruiser concept in December 2002. In its place, the company has decided to refocus its attention on a conventional 250-seat design that had been under consideration in tandem with the Sonic Cruiser. 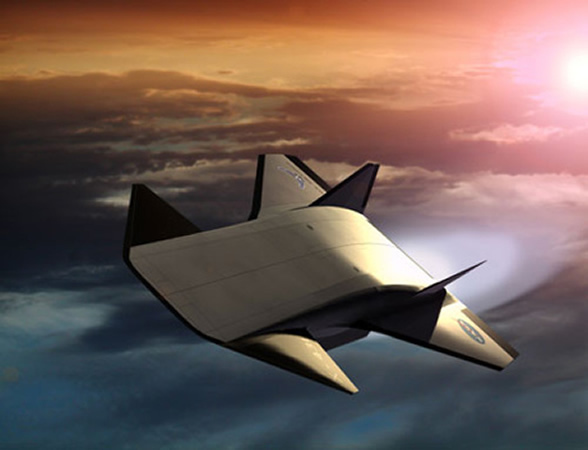 The conventional design, originally known as Project Yellowstone, will cruise in the Mach 0.8 region but incorporate advanced "super-efficient" technologies to significantly lower operating costs in comparison with today's airliners. However, the new airliner is apparently not to be known as the 787 but has been designated the 7E7, E standing for Efficient. We now know that the 7E7 designation was only temporary and the new Boeing aircraft has been officially renamed the 787. Since the basic designs of both the 767 and A310 are getting upwards of 25 or 30 years in age, a replacement in that market is probably a wise move on Boeing's part. In addition, the potential savings in operational costs offered by the new efficient technologies are very appealing to cost-concious airlines. A completely different path that Boeing may choose to pursue in the near future is the Blended-Wing-Body, or BWB. Despite your rather unappreciative comments, some of our staff have had the opportunity to meet with and talk to one of the concept's creators, and we've found it to be a most interesting design. The BWB is related to the flying wing, but is a somewhat more sophisticated concept that resulted from a study to determine the optimum low-drag shape to contain a given volume of passenger space. The resulting fuselage resembles a flattened sphere that tapers down and blends into the outboard wings, hence the name Blended-Wing-Body. 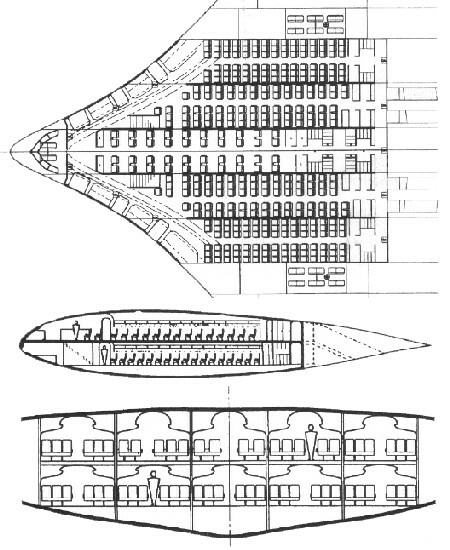 The thick center-section could hold some 500 to 800 passengers, as illustrated below. Additional studies have focused on smaller variants in the 250- to 300-passenger range, and a recently reported study indicated that a cruise speed of Mach 0.9 over a range of 7,500 to 8,900 nm (13,875 to 16,465 km) might be an optimum design point. The BWB was first created by the commercial aircraft division of McDonnell Douglas (MDD), a firm that was purchased by Boeing in the mid-1990s. 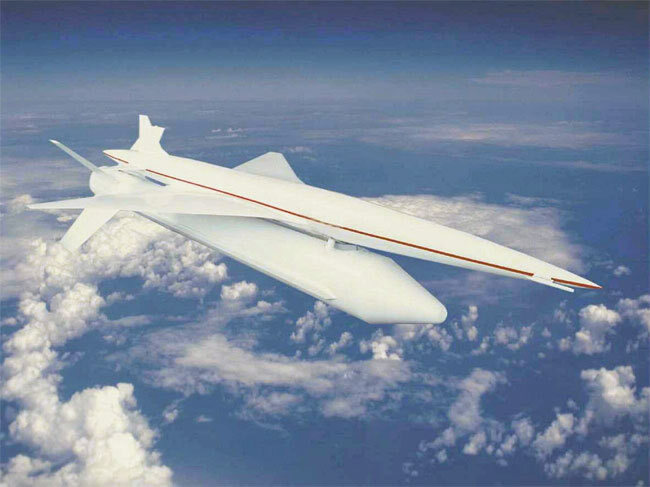 Though Boeing expressed little interest in continuing most of MDD's projects, they have shown the foresight to carry on low-level development of the revolutionary BWB. 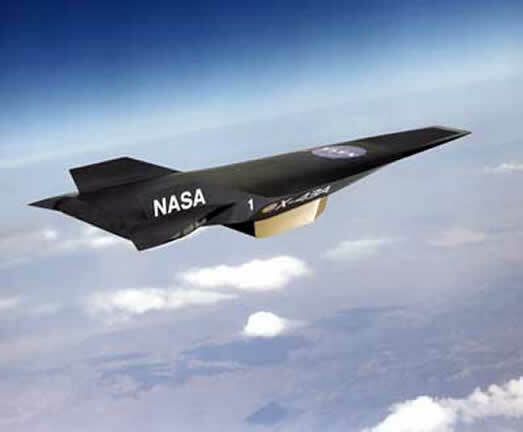 However, Boeing has not yet provided any indication that the design will go into full-scale development or production. While such an aircraft could potentially reduce operating costs significantly, concerns have been raised about compatibility with existing airport infrastructure and the difficulty of evacuating so many people from the deep interior cabin in an emergency. In addition, many airlines are worried that passengers may be unwilling to fly an aircraft that is so different looking from what they are used to. That pretty much sums up what we know of the possible future directions Boeing may take, but Airbus is even more of a mystery. 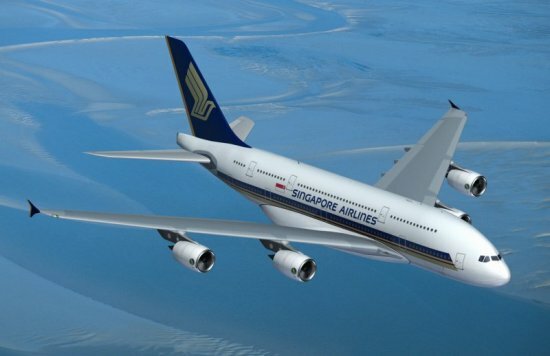 The multinational conglomerate has focused so much of its efforts on developing the latest variants of the A330 and A340 as well as the completely new A380 that little is known of what its next big project might be. The first mystery we can address is what happened to the designations in between A340 and A380. Airbus apparently conducted some sort of market research when looking for a name for its latest product, originally known as the A3XX. Immediately eliminated was the designation A370 since the number 7 is so often associated with rival Boeing. For whatever reasons, the numbers A350 and A360 were also deemed unpopular and appear to have been skipped, perhaps permanently. A380 was eventually selected primarily because the cross-sectional shape of the fuselage resembles the digit 8, but also because 8 is considered a special number in Asian cultures, the primary market at which the A380 is aimed. As for future projects, it was mentioned earlier that the A300/A310 series is nearing the end of its production run, and a replacement for this class of airliner is the most probable candidate. The company is considering a number of different options, including a stretched variant of the A320, known as the A322, or a shortened variant of the A330, dubbed the A330-500. However, a more likely possibility is a completely new class of airliners to fill the gap between the narrow-body A320 and widebody A330. If built, this class of airliners would probably include a shorter-range 200-passenger model and a longer-range 250-passenger model, both with a tentative service entry around 2010. This class of airliners has tentatively been named the A305, and no plans have yet been announced for any A390. Airbus has in fact committed to this new airliner, but it was given the designation A350 instead of A305. Again, this decision appears to have been made purely for marketing reasons as Airbus wanted to emphasize that the A350 is a new design and not merely an update to the aging A300 family. Though this answer has included a number of possibilities and been vague on what might actually happen, you must remember that Boeing and Airbus are bitter rivals who purposefully obfuscate their intentions to keep each other off balance and maintain their competitive edge. As a result, we really have no idea what projects they might actually decide to pursue or when. We can only make our best educated guesses as to where the airline market is going and what classes of aircraft are likely to be in demand.